The Village Sanitation Pilot Study (VSPS) is taking a new approach to addressing wastewater problems that affect communities throughout Vermont and beyond. With grant funding from the High Meadows Fund, the VSPS is a collaboration between Windham Regional Commission, Rich Earth Institute, and Nutrient Networks. The study seeks to engage community members to help develop a feasibility study for innovative ecological sanitation systems, how they could be utilized and what benefits they may offer. The study focuses on the viability of various options for retrofitting existing or planned infrastructure with composting toilets, urine diversion, or greywater treatment systems. Residential, commercial, and public buildings are all eligible to participate in the two villages selected for the project: Westminster West & West Dummerston. The study will explore what a neighborhood scale innovative sanitation system might look like if individual homes were to adopt composting or urine diverting fixtures. Villages are cultural and commercial centers of our communities, but the inherent density and small lot sizes make on-site wastewater systems challenging to install, upgrade, or expand. Ecological sanitation alternatives may offer a cost-effective approach to addressing nutrient pollution and drinking water protection issues related to on site wastewater management. This project is facilitating a deep conversation about how community centers can take an integrated approach to planning, economic development, change management, housing, sanitation, and environmental protection. Nutrient Networks is conducting individual site visits with participating homes and properties. These visits offer an introduction to ecological sanitation systems, an opportunity for residents to ask questions about various systems, and to assess feasible options for potential retrofits or future construction plans. When Habitat for Humanity of Cape Cod started designing an affordable housing project in Truro, at first it looked like they would be able to fit two homes on the site. The limitation was primarily due to the limit of how much on site wastewater infrastructure the site would allow. 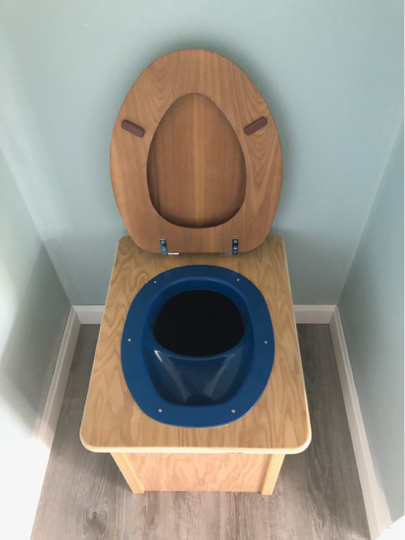 However, the leadership at Habitat thought outside the box, and with encouragement from the Barnstable County Department of Health, began looking at composting toilet technology, and how it may allow for additional housing on the lot. Nutrient Networks provided permitting guidance, planning, and installation services for a Phoenix Composting Toilet system. By using a dry composting toilet, Habitat was able to build an additional one-bedroom house on the lot. Greywater was tied into septic system shared with the other houses. This project demonstrates how sustainable building practices can be affordable and offer immediate and long term cost savings. The project also shows how new construction in ecologically sensitive areas can use ecological sanitation to minimize or eliminate impact on water resources. The Cape is a hot bed of nutrient pollution and Habitat for Humanity stepped up to show what Cape community can do to mitigate it. Nutrient Neworks team members Conor and Ben are back from New Zealand where they were installing composting toilets for Camp Glenorchy, a Living Building Challenge project. Glenorchy is a small town of about 300 people in the southwestern region of the south island. The small, quaint town is situated at the northern end of Lake Wakatipu, where pristine waters of the Dart and Rees Rivers flow down from mountain headwaters and the Earnslaw Glacier. The town sits between the towering Richardson and Humbolt mountains. Camp Glenorchy is New Zealand’s first Net Zero Energy accommodations, providing lodging and gathering space for visitors and adventure seekers. Conor and Ben installed a total of 14 composting toilet units throughout the campus, which consists of 7 guest cabins, an amenities building, a community building, and a maintenance facility. Site-wide use of composting toilets allowed for constructed wetlands to be integrated into the landscape for greywater treatment. Finished compost will be utilized on site to build soils and nourish native plants.